Emissions from electricity generation (largely coal) increased 40.8% between 1990 to 2002. Did you know that lighting is responsible for 33% of commercial emissions? 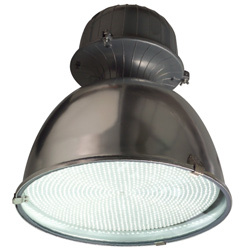 Our 120 watt LED High Bay Lights use up to 70% less electricity than regular sodium vapour high bays. They feature the highest quality LEDs, emitting a similar amount of brightness, but at a substantially reduced cost and last up to 10 times longer with low loss of illumination. These provide a great source of general illumination, suitable for use in factories, warehouses, supermarkets and other large retail. They come in 5000-600k colour temperature. The tubes have been tested by NATA and MTI and are CE and UL approved. LED High Bays will last up to 10 years and or 100,000 hours. LEDs do not flicker so they are suitable for people with sensitive to flickering lights (migraine or Epilepsy suffers). LEDs are not UV so do not attract insects.